That's the way I would describe my brother. For as far back as I can remember, chocolate has been his favorite food. Chocolate ice cream, chocolate chip cookies, chocolate milk, etc. The only other food item he uses that much is ketchup. So when I was checking out all the delicious chocolate at the new Hotel Chocolat store on Newbury Street, I found something that I had to buy for him. Without hesitation I picked up a bag of Cocoa Pasta (a nice, chocolate penne). I shipped it home in time for Thanksgiving so he could share with the rest of the family. Well, it turned out that he didn't have time to share. He took the pasta home and made himself an interesting dinner with half the pasta. I'm not sure I would have made it for myself, but he assures me that the cocoa penne was delicious with meatballs and tomato sauce. Kind of like a reverse mole? Luckily, he saved the rest of the pasta to share when I went home. To compliment the pasta, he decided to whip up a fancy dessert sauce. For my Chanukah present, my brother bought me a bottle of ChocoVine. It is exactly what the name implies. According to their website it is "the great taste of Dutch chocolate and fine Cabernet wine". It was good on the rocks, but we decided it would be good in a dessert pasta sauce. To round out the sauce, he melted semi-sweet chocolate chips and added in some strawberry preserves for some sweetness. My grandparents added some vanilla and chocolate moose tracks ice cream to top off the dish. It was rich and delicious. Next time we'll add some whipped cream and marshmallow topping make it even more decadent! 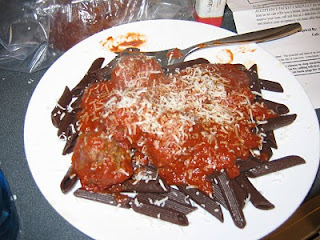 I've been told that I have to go back and buy a few bags of pasta to ship to my family for more inventive dishes!